To create something new, you must be willing to give up what you currently hold. To obtain it, you must die to the status quo. You must bask in the glory of discomfort. You must embrace a path with no map. Where you feel comfort, you must press on until you tremble at the view of a completely blank canvas. This is the fourth time since joining Hearsay that I’ve defined myself. Sought to find the optimal way to add value to the company in manner that was possible for my skill set, appropriate for my life state and aligned with my motivations. It is not lost on me that in the same time (nearly six years) the company has redefined itself nearly as many times, we’re on our third name & our second product evolution. To make a living dealing in ambiguity, one must become comfortable with uncertainty and all of the side affects that come with it. Questions you can not yet answer. Expectations you can not live up to. Goals you can not yet set. I remember the day before I started. I was heading to San Francisco with two surfboards, one bag of clothes and no idea what my first week would look like. 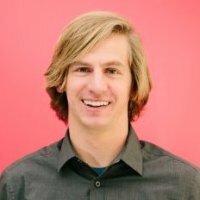 I was leaving behind a world of marketing to join the product team of a Silicon Valley startup based off of one day of interviews and the assurances of a friend. My job was made up – it wasn’t even the one I had interviewed for. The title was made up too – just enough real sounding words that my mom wouldn’t worry. When people asked me what I was doing, I couldn’t explain my role, I couldn’t even really explain the company (they didn’t even have a website), all I had to go on was that the people that gave money to Google and Apple back when they started had given my bosses $3 Million and I was going to try and help them make better decisions about how to use it. I remember that feeling the first week of not having a plan. I sat looking at my blank terminal. Empty black staring at me. Something between peaceful and horrifying. I’ve found paranoia is the best driver. Where there is no pull for your attention, you must find something to push. Successful founders each have their driver. My kind keep pushing on for fear that to stop doing so will mean death. I bask in the fear of being fired for not adding enough value. Even when it is not realistic, I create the fiction to motivate myself. The least comfortable state for me is one where I stop fearing the axe because I know how critical I am to success. Eighteen months later I was leading a team that was responsible for using data to power our company & customers. We gave monthly presentations to the company about usage data, we defined the metrics our customer success team presented to our enterprise customers, we managed our reporting system and we were investing in machine learning to figure out how we could predict buying behavior. I had a backlog of 50 items, my calendar was booked, I got to join top floor meetings with Fortune 100 executives and present our data learnings. I was the data guy. I had a niche that added value. When you give up a defined role your calendar opens up. Where you were once triple booked, you begin to have days that are completely open. They stare at you like the blank terminal once stared at me. The quiet always makes me nervous. The days where no one has urgent questions. I refresh my email to make sure it isn’t broken, I’m not on the distribution lists any more. When you’ve found a place that you are valuable, you day defines itself. You have commitments, people asking you questions, fire drills and planning. It can seem overwhelming. When you are searching, there is nothing pulling on you. You must create value out of the air. Your job is to create the business that you will then leave behind. When we first started to sell my product, every meeting was so significant. I would fly out the day before, stay in a hotel, attend the one hour meeting and fly back home. Two days would be justified in that one meeting. Two years later I had optimized travel. An implementation meeting in the midwest, a sales call while driving a rental car to a city two hours away, the next set of meetings, a check-in with the engineers from inside the airport before hopping on a flight back. With each iteration you know more. You have a roadmap for what you did before, so you must do something even more different than your last type of different. Your area of comfort has grown, so you must go farther away. In 2015 I was trying to figure out how to turn a company that had built, sold & serviced a single product its entire life into a company that would offer two products. That ambiguity will never again exist. We now have a proven model for doing that. Adding the Nth product will never be the same type of challenge. It will present challenges, but not existential ones in the same severity. To deal in ambiguity, you must find a path never travelled. Once you learn how to walk with no trail, that itself becomes solved. You must then learn to fly. My first job title at Hearsay was made up. Really, all titles I’ve ever had have been pretty high on the scale of made-up-ness. Even ‘product manager’ which is the most recognizable, is a job that means 20 different things to every 10 people you ask. I am fully embracing the ambiguity. It is neither clear what I do or where I am going. I am neither responsible for any domain, nor limited to any. I will add value where it is most appropriate, be that through dirty hands, soft influence or coordinated efforts. I am not my role. I am not the domain I own. I am value addition personified. But for those that need a name – I offer only that I am the Chief Bottle Washer.